This is a one-off opportunity for loyal taste followers to experience the changes at Rustic Stone. With todays taste giving you the opportunity to try Dylan’s flagship contemporary and stylish restaurant, Rustic Stone. 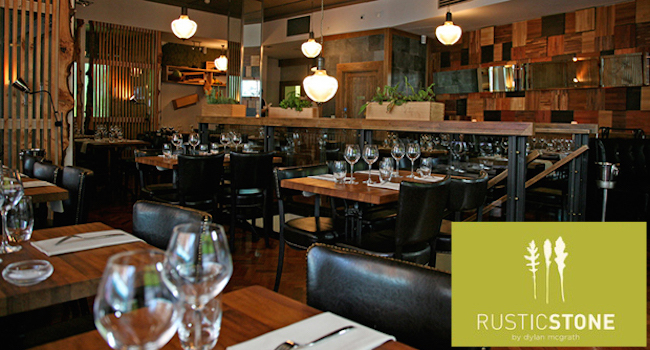 Rustic Stone in considered one of the best restaurants in Dublin and received a Georgina Campbell Guides Award. Dylan received his first Michelin star in 2008 for his cutting-edge contemporary restaurant Mint, when Image food critic Domini Kemp considers Dylan McGrath a “creative genius”. This is one taste we highly recommend, you will enjoy a 3 course dinner for 2 people plus a bottle of wine only €50. Vouchers are valid Sunday to Thursday, until the 18th of June 2015. Rustic selection of organic, sour and crunchy breads with my very own cumin scented hummus and baba ganoush bound with hazelnut oil. I hope you like this marriage, butter it if you want to. The city’s favourite, the oul chicken wing. Here I’ve done ‘em in some sticky soya and crushed roasted sesame seeds with fresh grated lime zest, garlic chips, red sprouts and coriander. This wonderful, versatile fish was blessed with a layer of fat that renders perfectly on the stone. Careful not to blow the flavour! Walnuts will do. Eat it quick if you like sushi or take it slow and let the fragrance and herbs infuse with the fish. Smoked haddock poached in soya milk with rocket, shaved fennel, watercress, wild leaves, broccoli, avocado, quinoa, cucumber, peas, broad beans and alfalfa sprouts. Simply bound in a little olive oil with a squeeze of lemon. For those of you who take smaller bites, I have put all of the above in two buns of sesame seeds and smoked paprika alongside parmesan and black pepper. Served with polenta chips. Poached Free Range Chicken slices with Pickled Mushrooms, blanched asparagus long stem baby artichokes with broccoli slices bulgar wheat watercress tarragon parsley wild rocket and little truffle oil. My favourite vegetables made into a purée. Keeps you fuller for longer. Warm Catalan mousse and orange sorbet. I’ve made a wonderful chocolate soup and mousse, but the best part of it is that it is completely sugar free, and finished with some roasted grated hazelnut. Traditional French spiced brulée with ginger bread and pear sorbet.